Back At It Again- From MY OWN Kitchen!! Hot damn; I’m bloggin’ again! I can’t tell you how many times in the last 6 months I’ve said to myself “I really want to blog… but I’ve got nothing.” You may ask “Why nothing?” To which I answer “because of the kitchen from hell with which I was making do.” See; when we moved to South Dakota I was in Colorado with the kids and my husband was in the Dakotas/Minnesota area working and it was almost impossible, as the new guy, to get time off to go look at places to live. So we went down to the wire and found the mobile home that would be ours with only a couple of days left before he came back to Colorado to get us. The mobile home was AWFUL but it was what we could get. 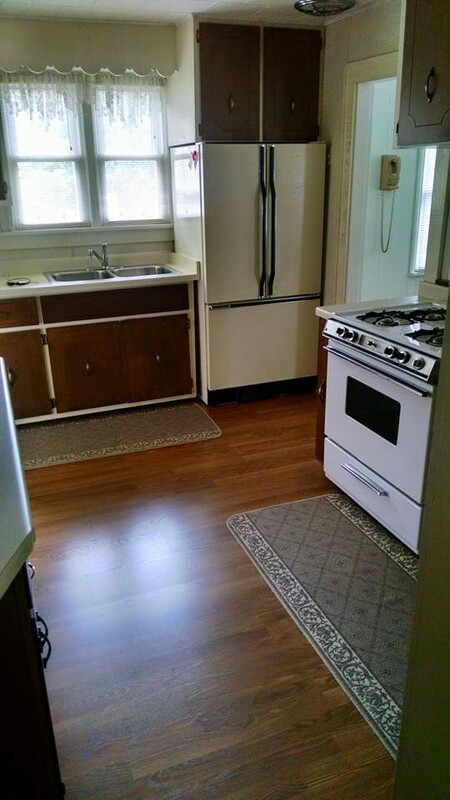 Unfortunately, the worst part was the kitchen. My stove couldn’t boil a pot of water reliably (I’m not joking), the oven turned out to be incredibly finicky, and I had almost zero counter space. I literally had about a 3 inch width of counter space to work with most of the time, otherwise known as “the counter in front of the sink”. I’m perfectly serious; that’s all I had to work with. The tiny amount of counter to the right of the sink was constantly full of drying dishes and counter top stuff that could go NOWHERE else, the stove had hot spots over the pilot lights for the burners; if you weren’t careful, just setting something on the stove would melt it and I burned myself a few times by forgetting those hot spots were there. All this to say that as the days wore on and I tried to cook and bake I was met with failure after failure. I’ve cooked in inadequate kitchens before. I started this blog cooking in one, in fact. But the kitchen in that mobile home was totally and completely unusable for anything beyond frozen pizza and what could come out of the microwave. I went back to buying nearly everything premade. Our budget suffered because that stuff is way more expensive than homemade and our waistlines suffered because it’s also far less healthy than what I make from scratch. I haven’t blogged because there was not a single thing coming out of that kitchen that was blog worthy. It was awful. It was depressing. AND IT’S OVER!!! If you’ll notice, I have been using the past tense in my explanation. We’ve moved! Yes; again. But not only that… We’ve bought a house! It’s in beautiful Northern Wisconsin and in desperate need of interior updating (meaning it’s a very sound house, but the previous owners seem to have not updated the inside since the late 70’s/early 80’s), but it’s ours and at a crazy low price! That means we can afford to make the aesthetic upgrades it needs. Yeah. Definitely needs some upgrading. But it’s actually MINE! I’m not borrowing it from family or renting it from a landlord. And, get this, the kitchen has crazy amounts of storage space! It may not look like much, but there’s plenty of counter space and very nearly my whole kitchen has been unpacked into it and I have cabinets and drawers left empty! Seriously!! I have never had enough space in my kitchen so this is amazing!! But, the kitchen not withstanding, I still have a lot of work to do unpacking the rest of our stuff. This being the case, I’m trying to make sure I cook easy meals with as little clean up as possible so I can do what I need to do in the rest of the house. I’ll have plenty of time for kicking around the kitchen after our stuff is unpacked. 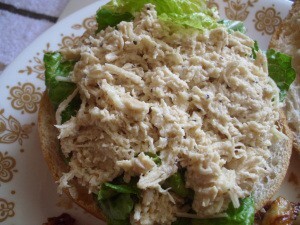 So this week I’m re-sharing my recipe for Crock Pot Caesar Chicken. It’s quite possibly THE easiest recipe I have in my entire repertoire. It truly is almost as easy as ordering takeout, it tastes fabulous, and there is a very small amount of cleanup. It’s also versatile: serve it as a sandwich, a wrap, on a salad, or even just on Triscuits or crackers!